Nope, not that Black Mirror series. Sorry. Black Mirror—a re-imagining of Future Games' 2004 gothic-horror adventure series—is now available. 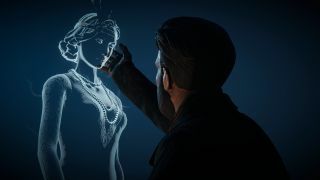 The remake honours the original game's point-and-click roots, focusing on "close-up investigation and interaction with nightmarish visions that plague the protagonist of the game David Gordon." It also promises to retain its "unique atmosphere of madness and psychological distress" as Gordon visits to his ancestral home in the 1920s, intent on discovering if he too will "follow in his father’s footsteps, down a path that leads to madness, and death". "Key features" include interactions with vision-like apparitions which help you learn more about your family's past, an eerie atmosphere focusing on the horrors of the mind, in the style of EA Poe and HP Lovecraft, and "high quality voice acting from a compelling ensemble cast". So far, Steam reviews are pretty mixed, but it seems fans of the prior game seem to be enjoying it.